Friday night was spent in Oakland. We headed up early before work got out to beat traffic. We stopped at Rock Paper Scissor Collective so I could drop of zine for the library (which was closed when we got there). We drove over to Banana Soy Vegan for dinner which started off with Matt's car alarm going off as soon as we ordered (which never has happened before). The restaurant is clean, the staff is attentive and the food was good. 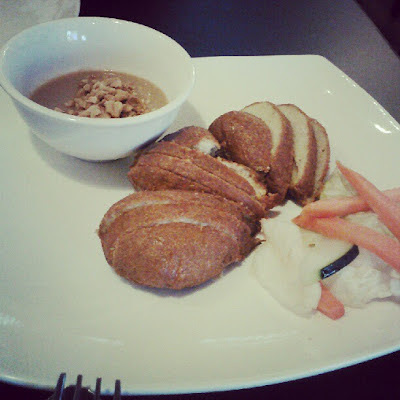 The 'chicken' sticks with peanut sauce is tasty and I am wanting more of the yellow noodles I ordered. If you like odd tastes like me - order the strawberry jam drink. It is like lemonade with a glob of strawberry jam at the bottom! After checking in at the venue where Matt was showing his movie trailer we went to Whole Foods. I was in luck - there was a massage therapist and for $15 I got a nice massage for 10 minutes. Matt and I bought a few things, checked out the large church across the street and shared a berry chocolate parfait from the bakery! After a night of performances, vending and showing Matt's trailer we headed home to our bed! Saturday we lounged around the house as much as possible. I had my newest zine The Stay At Home Girlfriend #2 printed later on. We ran errands and then saw Matt's trailer on the big screen again. Another late night and days later my body is still paying for it. I am happy for Matt though and I cannot wait till his trailer is complete (editing some stuff) so he can post it online!